Gameboard. Yoruba (Nigeria). Abeokuta area. Wood. L. 22 in. Collection: Worcester African Cultural Center. Photograph: Jean M. Borgatti. Figure C. Egungun headdress carved by Adugbologe of Abeokuta. Source: Willett, 2002, p.161. Detail:Gameboard from Worcester African Cultural Center Collection. Photograph: Jean M. Borgatti. Figure D. Ibeji made by Oniyide Adugbologe of Abeokuta. Source: Fagg & Pemberton, 1982, p.17. The artifact I chose to research is an African game board. 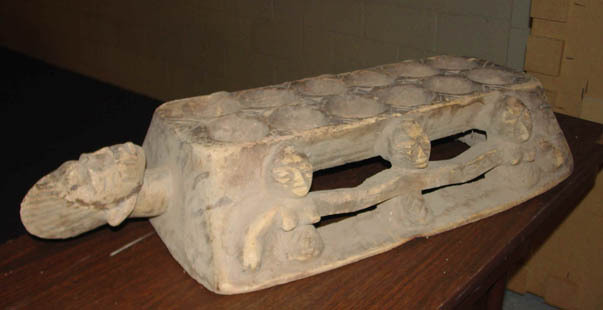 It is a carved wooden, fairly rectangular object with a total of twelve circular carved out pockets arranged in two rows, six pockets in each row. The artifact is very light, probably due to the drying out of the wood over time. There are elaborate carvings that decorate the game board, along the sides and on the top where the pockets are located. The artifact is actually more trapezoidal, than it is simply rectangular due to the fact that the top of it is larger than the bottom and therefore the sides slants inwards. The approximate dimensions of the game board are as follows: top  20x 12 / bottom  22 x 12. The shape of the game board is further accentuated by the triangular shapes that are carved around the circular pockets. The artifact is much more than just a simple game board with carved holes for game pieces; on the contrary the carved details add much more interest to the overall appearance of the artifact. Along both of the longer sides of game board are three people: two women and a man, the man is in the middle of the two women holding each of their hands. The holding of the hands seems to relay the message that this is a game that brings people together. Their features are very detailed especially those on the face. Each of the figures appear to be wearing some type of patterned robe. There is also a rather large head on the short side of the game board that is about 7 long. The head is facing upward (towards the sky), and has a very distinguishable hairstyle and prominent facial features. On the figures and the head are scarification marks on the cheeks and forehead. The distinguishable hairstyle along with the scarification marks allow for the viewer to identify this as artwork from the Yoruba people. After speaking with the owner of the artifacts of the Worcester collection, I have also learned about who would have owned a game board like this one and how it is played. These types of game boards are usually found in the town square. They are carved out of large tree trunks, along which many games that can take place at the same time. The game is played with two people, each person sitting on either of the longer sides of the board. Four seeds are placed in each of the carved wooden pockets. The row of six pockets closest to each player is considered theirs to try to keep filled with seeds. The players take turns by picking up all of the seeds from one of the pockets and distributing one seed to each of the pockets in order. The first player to empty the other players six pockets wins the game. It may be inferred that the way this game is played, face-to-face, reflects the values of the culture pertaining to interactions amongst people. Yoruba people prefer interacting with others face-to-face, or directly, rather than sending messages through other people. This value is revealed in the playing of Ayo. I also learned about who would own such an elaborate game board such as the one that I have chosen to research. I discovered that due to the elaborate carvings on the sides, it would usually be owned by a religious person of stature. 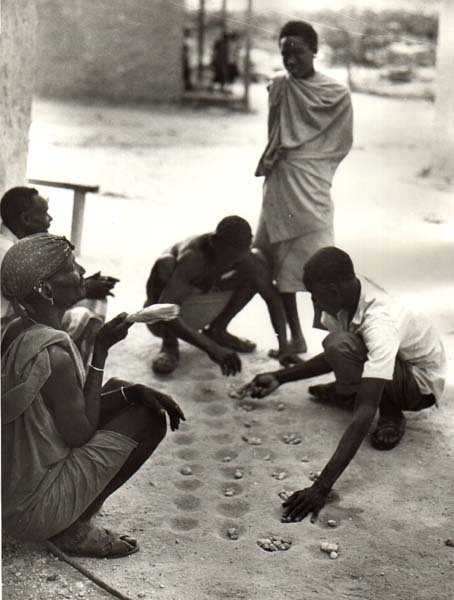 The name mankala or mancala as it is sometimes written is derived from the Arabic word naqala, meaning to move something around. Mankala is actually a general name for the many variations of the game that are played throughout Africa, as well as many other parts of the world. The names of the game boards are usually determined by what type of seed is used for playing, and game boards may vary as far as the number of rows of pockets is concerned as well as slight variations in the rules. 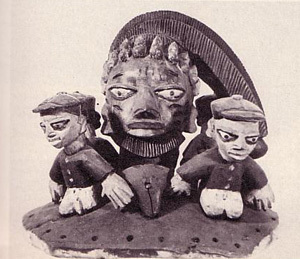 Because the art piece I am researching is from the Yoruba people, from now on I will refer to it as Ayo; but the Yoruba people will also refer to it as Ayoayo, meaning real ayo, which distinguishes the male version, from those played by women and children. It is played in a house of mourning to amuse the spirit of the dead before it is buried. It is very unlucky to play the game at night as the spirits will want to join in and may carry off the living at the end of the game. Each village would have two types of boards, one with a flat top and one with a curved top, a bit like a banana. When a man died the villagers would play on the board that was not his favorite, so that his spirit would not want to join in (Mancala Games 2004). It should be stated that these are traditional values that relate more closely to the origin and cultural significance of Mankala; nowadays, this game board is played worldwide and many of the original values are not upheld or recognized. The figural supports created on either side of the game board may also represent certain cultural values of the Yoruba people. As stated previously, there is a male figure between two female figures on each side of the board. Relationships are said to be an important part of their culture, and the relationship between men and women may be reflected in this piece of art. For the Yoruba, life is an aggregate of relationships  relationships with other persons, with nature, with disease and death, and with ones own past, as well as ones personal destiny. Relationships are never static (Fagg and Pemberton p.164). Traditionally, Ayo game boards are made of wood and are carved with intricate designs. The sound of the seeds, or whatever medium one uses for game pieces, dropping into the depressions is said to rhythmic, and the wood becomes smooth and conditioned from the constant motion of the game pieces. Game boards can also be made out of clay, rock, or even simply by carving circular depressions into the ground (seen in the photograph to the right), while game pieces can range anywhere from seeds to nuts to cowrie shells, even pebbles are acceptable, but it is important that the pieces are fairly uniform in size and shape. It is important to compare this particular Yoruba piece with other artwork from the same region in Africa in order affirm its origin as well as analyze specific perspectives in relation to features that distinguish this piece from other Yoruba works of art. It has previously been noted that the majority of mankala game boards created throughout Africa are not elaborately carved, and the fact that this Ayo does contain carvings of people on both of the longer side of the board as well as a head at one of the shorter sides means that this board was created for someone of high political or social status. The facial features of the people on the game board are also of importance. The faces show scarifications on the cheeks and forehead that allow the viewer to associate this Ayo board with an artist from the Yoruba region of Africa in Nigeria. The rather different hairstyle, or coiffure resembles a crest running from the front of the forehead to the back of the neck, along with the bulging eyes, elongated nose, broad nostrils and large lips also provide important information in relating this piece to the Yoruba peoples. The large, protruding almond-shaped eyes are also a very important characteristic of Yoruba carvings. These features can also be seen on the Yoruba wooden form represented in Figure A. In comparison with other mankala boards found throughout Africa, the Ayo game board analyzed in this paper is not all that detailed. The wood is worn and has not been treated with any type of dye, unlike many others which are very dark and polished. It appears as though it may have had some type of darker finish, due to the small remnants that remain of the darker wood, but overall it looks as the finish has been removed. The game board to the left (Figure B) is elaborately carved and the fact that it is made with two rows of six pockets denotes that it is from northern or western Africa, and this particular board is from Sierra Leone, which is west of Yoruba. The simplicity of the Ayo game board in comparison with other mankala boards from the same region could mean a number of different things. It is possible that it was a piece created for someone that was not of exceptionally high social status, but it is also possible that it is an older piece and some detailed that may have been present when the piece was first created have been worn off. It is important to note that the piece cannot date before the 19th maybe even 20th century, since wood can deteriorate very quickly, especially in Africa where termites are very prominent. Although the figures on the Ayo game board are not painted, they are very similar to a more recent sculptural piece from the egungun cult of the Yoruba (Figure C). This particular piece depicted in Figure C is from the Abeokuta region. 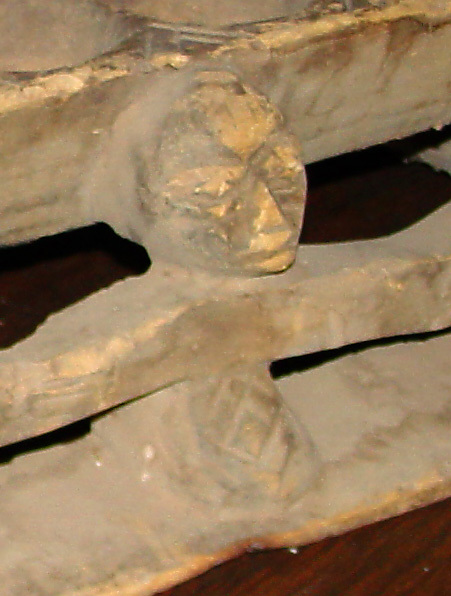 The facial features are very similar and the stature and positioning of the body as well as the technique used to carve the hands are very much alike. The reaching out of the arms as well as the proportionality of the features share a striking resemblance to the game board under speculation. Although it is not as visible in the pictures taken of the Ayo game board, the figures appear to be wearing woven skirts depicted by cross hatchings in the wood. This technique and style of clothing is also represented in an art piece of an ibeji figure from Abeokuta. The three scarifications on the forehead and both cheeks, along with the coiffure and the wide nose also support the idea that the game board may also be from the same area (Abeokuta). It is also important to note that it is traditional for art from the Abeokuta region to be marked with a logo of sorts, which is viewed much like a signature in Western art. This trade-marking is traditional only to this region of Yoruba. Triangles are carved along the sides of the game board as well as at the top and bottom, possibly signs that this it is also a piece from the Abeokuta part of the Yoruba region. The Ayo game board of the Yoruba people although it appears to be a traditional piece, I believe that it was created in the early to mid 20th century. The piece is not exceptionally detailed and it does not appear as though the artist was highly skilled, especially in comparison with other Mankala boards from the same region. Other game boards have some type of finish applied that give the wood a darker, more polished appearance whereas the wood on this board is rather light; it appears as though it may have once had a some type of finish, but most traces of the finish have been removed. I have concluded that this Ayo board is from the Abeokuta region of Yoruba land, due to facial characteristics and the appearance of the coiffure it shares with many other art pieces from this area. Cultural connections and inferences can be made about the game of mankala, concerning interactions among people in Africa (e.g. : their preference to interact with others face-to-face, which is how the game is played). One can also infer about the meanings of the designs that appear on the sides of the game board and their cultural meanings, although we cannot be sure of the meanings due to the lack of collection data associated with many African works of art.